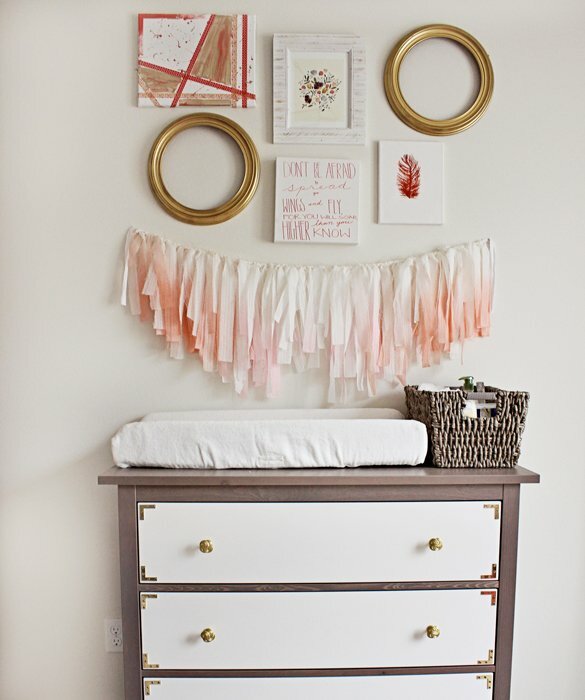 I’ve been thinking a lot about the nursery and figured I should start compiling my most favorite bits of inspiration. I want a room that is pretty and airy, and not too baby-ish. The colors I’m going for are light pinks (blush and flamingo-pink), peaches, golds, and whites. I don’t really want to do a theme, more just stick to those colors and have fun details. I really like florals and flamingos. This may be one of the prettiest nurseries I’ve ever seen. I love the use of flamingo pink here! I might need the tassels and the feather print! I love this one for all of the light and airy details. 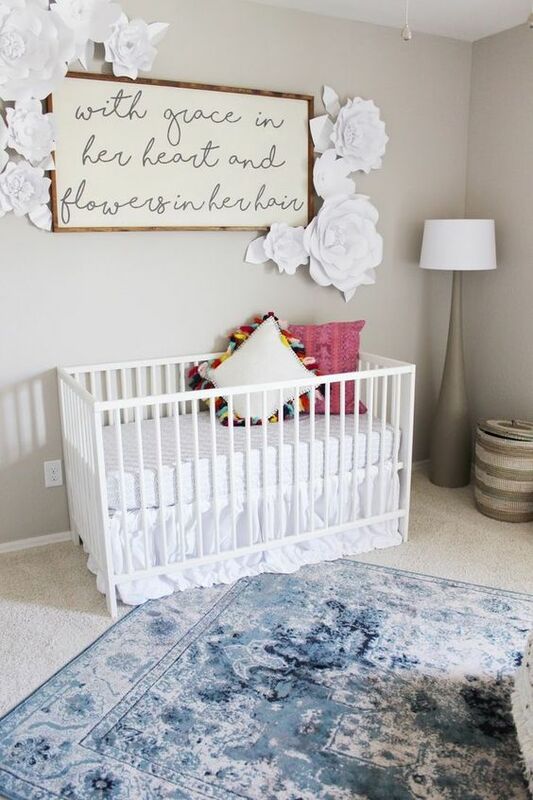 I adore this one for the “grace in her heart flowers in her hair” mural over the crib! Love it! 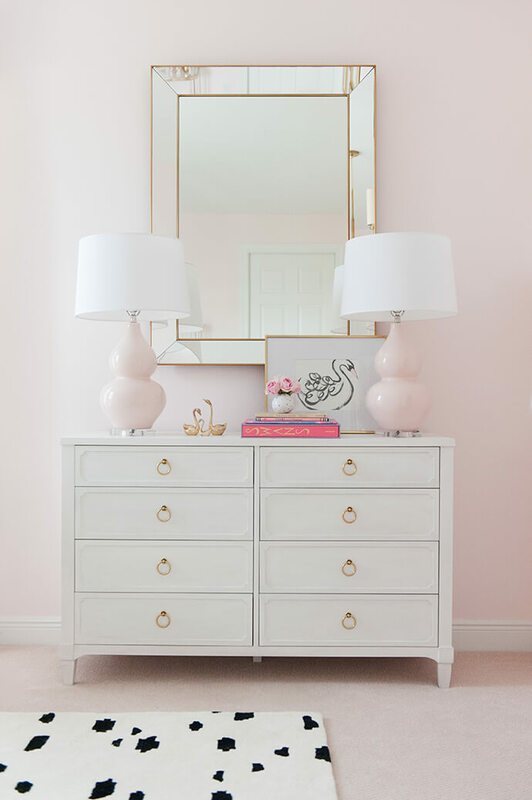 I love flamingo details for a baby girl nursery, so it just makes sense that I’d really like this swan filled nursery! Plus the blush and gold detailing are perfect! 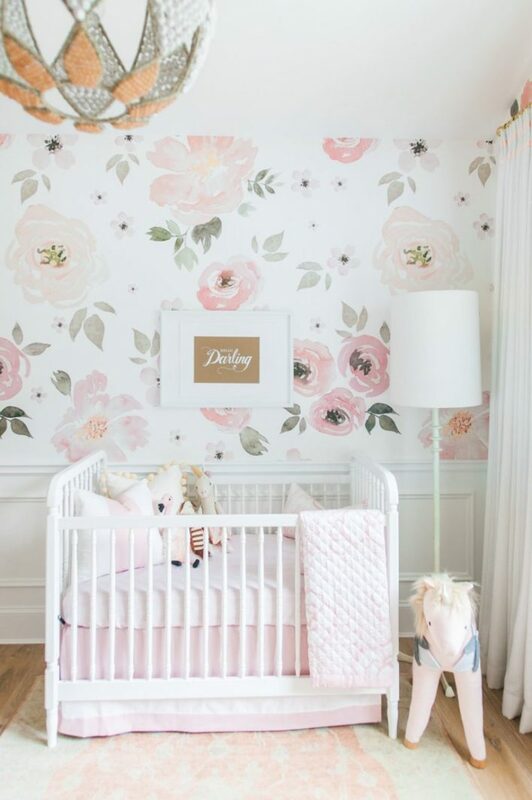 I’m only hoping my baby girl’s nursery will look half as put together as these! So far we’ve pulled up the carpet in the room (something we are eventually plan to do to the entire house), we’ve bought a dark bamboo hardwood which is sitting in our garage waiting to be put down, and we’ve sampled two grey paints! I was surprised to find that I’m leaning toward the darker of the two because most rooms I gravitate towards are such a light grey they’re almost white! The darker grey just has warmer tones in it that I think will go much better with gold details, versus the lighter grey which is all cool-toned, with almost blue tones. Hoping between the dark wood and the darker grey I’ll be able to keep most the furniture white, find some bright airy curtains and hang lots of pretty things on the walls to keep it from feeling dark in there. I’ve already got a white rug ready to go! Can’t wait to paint and get the floors in! With that, I’m signing off for the weekend! I know it’s only Thursday morning, but today is my Friday! :) We are heading to the San Juan Islands tomorrow with my brother and sister in law. (She and I are both pregnant with baby girls right now!) I can’t wait! I’ll fill you in when I get back!